Foundation work to begin this month, with a completion set for mid 2018. Seemingly out of nowhere, a major new building in the Medical Center will soon be taking shape. The University of Louisville School of Medicine announced Thursday that ground will broken on the so-called Pediatric Ambulatory Care Center on July 18, beginning with initial site work. The structure, to be built and owned by the University of Louisville Foundation on land owned by the university, will climb eight stories and cover 174,000 square feet. The $79 million Pediatric Center will be built up to the sidewalk at Preston Street, but has been designed with a blank wall—with no building entrance or retail—facing the street. The structure’s main entrance faces an interior wrap-around driveway inside the block accessed via Chestnut Street. But even though news of the Pediatric Center’s imminent construction sprang onto the scene suddenly, work has been going on internally at UofL for a year and a half. The press release from UofL, not its private foundation, said internal planning began at the beginning of 2015. By June last year, the architecture team had been named and a design begun. The local office of GBBN Architects and Atlanta-based architecture firm Stanley Beaman & Sears are handling the project. Messer Construction is serving as General Contractor, and engineering work will be handled by Atlanta’s Uzon + Case (structural), Louisville-based CMTA (MEP), and Louisville’s Carman Engineering (Civil / Landscape). 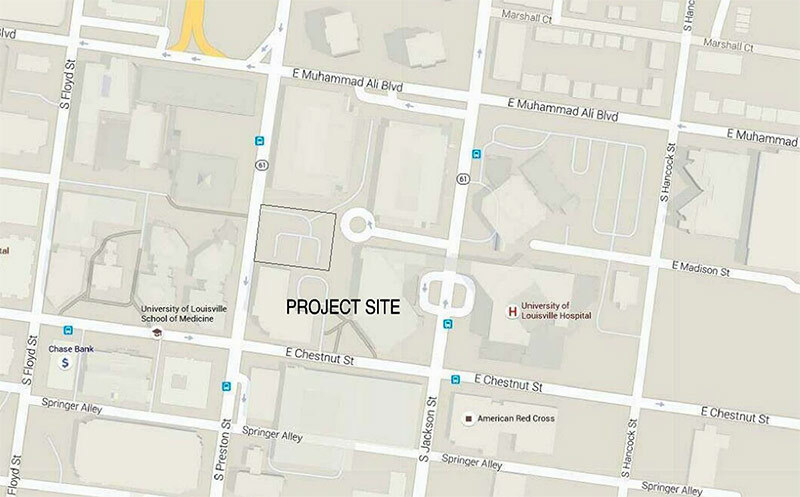 The University of Louisville owns the property covering the entire block, contains the Physicians Outpatient Center, University Hospital Ambulatory Care Building (550 South Jackson Street), UofL School of Dentistry, and a parking garage. In April, the university cut off a chunk of the parcel containing the Ambulatory Care Building to create independent 1.08-acre space for the Pediatric Center. 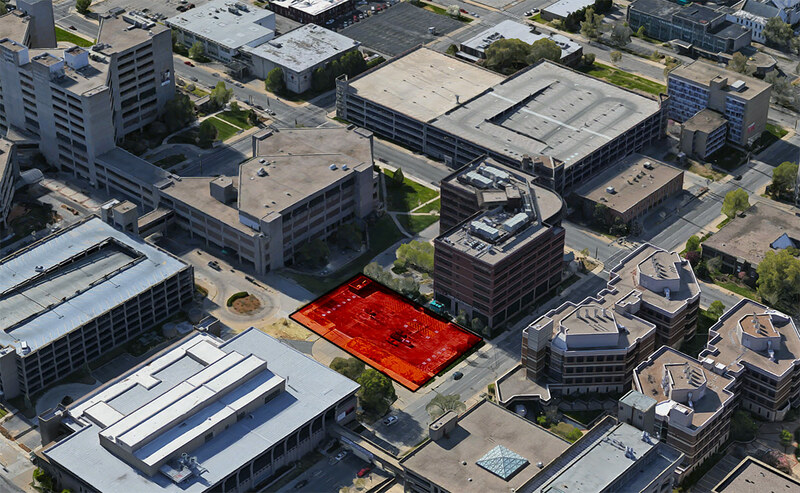 That move (16MINORPLAT1046) was approved by Metro Louisville staff in June, with the stipulation that a parking lot in the new parcel disallowed by OR3 zoning within the building footprint be removed. From the limited design materials available, it looks like the Pediatric Center will predominantly be clad in glass and metal panels. Windows on the colorful upper floors take on a random appearance that could give the building a more playful look, but their vertical proportion could also take on the appearance of a jail. Additionally, the structure’s massing is clearly an attempt to make the building appear more playful pediatric center, but additional details are needed to tell whether the structure’s masses will blend cohesively as a whole. Current More design information is needed to evaluate the structure. One design quirk hinted at in the structure’s plans is a dramatic three-story lobby with what looks like a birds nest theme. Inside, what look like hanging, nest-like seating areas fill the ground floor, while above, a bird mobile soars through the open void and diagonal ropes further the next reference. According to the university, the Pediatric Center will round up specialty pediatric practices from around the area into one central location. Additionally, a ground floor general pediatrics center is planned along with labs, pharmacy, and radiological suites. Plans show a large multipurpose conference space on the top of the building connecting to a variety of rooftop spaces, that the university says will be landscaped with gardens. The project appears to be undergoing fast track construction, with foundation work taking place first while the architecture team finished up future phases to complete the building. That initial groundbreaking slated for July 18 is for foundation work. A permit (Case# 129045-000-0) for this first expedited phase was already issued by the state’s Department of Housing, Buildings & Construction on May 26 and another plan review from a late June submittal is still pending. The development arrangement between the university and its private foundation appears to represent a sort of gray area in how the Pediatric Center project is being reviewed and permitted. The university can bypass local planning regulations and controls because of its state affiliation, but the foundation, as in cases such as at the Nucleus site, must go through local review with the city. This foundation owned building being built on university owned land apparently qualifies it to bypass local review and go through the state, hence the state permits lack of a development plan filed with the city. For those keeping track, one tower crane is expected to rise during this initial phase. Also for those keeping track, a site plan indicates the sidewalk along Preston Street will be closed and temporary crosswalk indicated at the northern side shown, making this construction site better than some around the city. The university’s press release says an “official groundbreaking ceremony” including “more details on the overall vision for the building” will take place in the fall. The intent of the Pediatric Center is to create a sort of one-stop shop allowing “parents easy access to pediatrics specialists and primary care providers in one location, with everything designed specifically for children and their families,” according to a statement by Dr. Gerard Rabalais, chair of the UofL Department of Pediatrics. That consolidation effort appears to have been a long-term goal for the university. In a June 30, 2014, report in Medical News, the university began consolidating offices, first closing its office at Floyd Street and Broadway, instead “creating a single expanded downtown practice, the Children & Youth Project (C&Y), located a few blocks away.” That program was rolled into the university’s UofL Pediatrics Downtown at 555 Street Floyd Street. Another 2013 partnership between UofL and Kosair Charities combined pediatric care and dental at the Sam Swope Kosair Charities Centre, 982 Eastern Parkway, with a five year lease ending in mid 2018, the same time the new Pediatric Center of expected to open.